At the Gosport factory of Norjon Precision Engineering, a high-speed DA300 vertical machining centre from the Japanese machine tool manufacturer Makino — the first of its type in the UK — is the sub-contractor’s ninth trunnion-type five-axis machine; and while it is intended primarily for the highly productive milling and drilling of aluminium components, the machine is equally capable of machining stainless steel for long periods. The DA300 was supplied as a turn-key package by sole agent NCMT Ltd, Thames Ditton (www.ncmt.co.uk), complete with an Erowa storage and handling system for 24 pallets. Kevin Fox, Norjon’s managing director, said: “We only buy high-quality machines, as most of our customers demand a high-quality finish. “Makino has a reputation for being at the top end of machine tool suppliers in terms of accuracy, reliability and performance, and this particular model is considered to be very fast, with 60m/min rapids and a 20,000rev/min spindle. Mr Fox went on to explain that the DA300 is built with automation in mind, being fitted with pneumatic ports in the table, “so interfacing the Erowa Robot Compact 80 was seam-less. If production work is involved, Norjon would in future not consider installing a machine tool that does not have automation; in Mr Fox’s opinion, “it is essential to achieve the required output. “Without automation and the extra 60hr of unmanned production every weekend, we would not be able to keep pace with customer requirements. 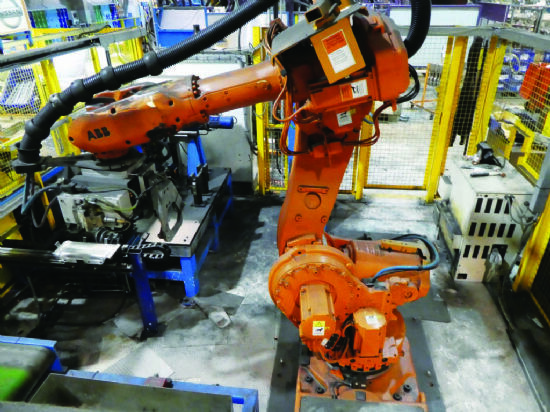 “The alternative would be to install additional machine tools, which would be added expense; and in any case, there is little spare room on the shopfloor. When the Gosport factory was visited for this application story, a family of aluminium prismatic components was being produced in the Makino/Erowa cell. Mr Fox said: “We initially set the job up on a Friday evening and inspected the first-off component. 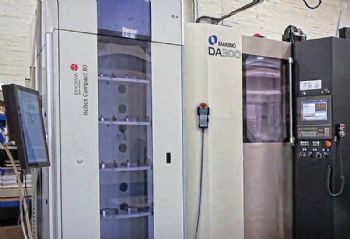 The Makino DA300, which is capable of the fully interpolative five-axis production of complex components, features integral direct-drive motors for the swivelling A-axis trunnion (+30 to -120deg) and the C-axis rotation of the 340 x 300mm table, plus a 20,000rev/min 22kW HSK-A63 spindle capable of “rigorous milling, drilling and tapping”. 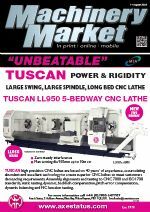 Meanwhile, a 60-tool magazine ensures the availability of an extensive selection of cutters to tackle the most complex of parts or component families, while the Fanuc-based Professional 6 CNC system provides streamlined screen layouts, operator assistance and macros designed to maximise productivity. For example, a G-code drilling cycle allows the tool to ‘arc from hole to hole’ instead of following a square path, reducing non-cutting time when drilling a typical hole pattern. Furthermore, a vision sensor outside the machine’s work zone detects broken tools, to ensure cutter integrity without affecting cycle times. Workpieces up to 450mm in diameter, 400mm high and with a maximum weight of 250kg can be machined in the 450 x 620 x 500mm work envelope; and as well as rapid feed rates, the rotary A and C axes are fast — at 100 and 150rev/min respectively. Meanwhile, spindle acceleration and deceleration to and from full speed takes just 1.5sec, minimising chip-to-chip times. Accuracy is ensured by linear-scale feedback in all axes. 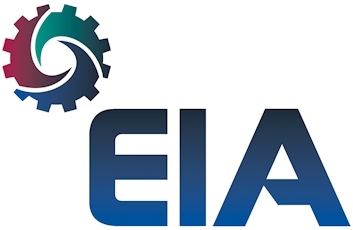 Intelligent machine functions include Inertia Active Control, which is designed to maximise the speed of the machine’s motions based on dynamic loading; also Collision Safe Guard, a real-time crash-avoidance feature that has a look-ahead function and takes “real machining conditions into consideration”. Additional standard features include temperature control via cooling of the machine structure, spindle, ballscrews, bearings and drives.